"This is a vile business." With a career that spanned over half a century and 79 novels and short story collections to her credit, Agatha Christie (1890-1976) is the world's most popular mystery writer, who is outsold only by Shakespeare and The Bible, with over two billion copies published worldwide. Her most famous character, Hercule Poirot, was introduced in 1920 with her debut novel, The Mysterious Affair at Styles, and would appear in 33 of her works. Ten years later Christie would create another enduring character, the ever inquisitive Miss Jane Marple of St. Mary Mead. Unlike Poirot, Miss Marple is anything but a career detective, instead, this unassuming spinster is a busybody with an uncanny ability to find herself embroiled in murder cases, much to the chagrin of the police. A master of gossip, she also is notorious for picking up details often overlooked by the officials, and her deductive reasoning and cunning make her a formidable asset in solving crimes. Over the years a number of actresses, including Gracie Fields, Margaret Rutherford, Helen Hayes, and a much too young Angela Landsbury, have portrayed Miss Marple, but it was Christie herself who hand picked the perfect embodiment of her character in Joan Hickson, some 23 years prior to her taking on the part. From 1984 to 1992, Hickson would star in the BBC television adaptations of the entire collection of twelve Miss Marple stories, of which nine are currently available on DVD. When it comes to portraying literary-based characters, the problem is often that the actor is seen acting the role. Such is not the case with Hickson�she is Miss Marple. Therefore, it is not at all hard to find oneself fully involved in the stories, as the facts and numerous red herrings are laid out before the audience. Hickson plays the part quite reserved, but her brilliant sleuthing is presented when all the cards are on the table, and that knowing glint in her eye foreshadows the unravelling of the installment's mystery, often with unexpected results. Each episode utilizes different writers and directors, which work to their advantage by allowing a slightly different angle to be pursued with each outing. The production values are high, with extensive location shooting, elaborate interiors and period detail. Christie's first story featuring Miss Marple was originally published in 1930. Taking place in her hometown of St. Mary Mead, Miss Marple becomes a key witness to murder, but her observations leading up to the event present a number of possible suspects and motives. Although the victim is highly unpopular in the village, when one of the town members confesses, the story doesn't add up, leaving our senior super sleuth to uncover the truth. First introduced in 1984's The Body in the Library, David Horovitch and Ian Brimble return as Detective Inspector Slack and Detective Constable Lake, who reluctantly employ Miss Marple's assistance in finding their killer. The chemistry between Marple and her detective allies is most amusing. Miss Marple receives a letter from one of her friends who has recently passed away, who asks her to embark on a bus tour to solve a mystery, but to complicate matters, doesn't indicate what the crime is supposed to be. She is not the only one summoned for the journey however, and when one of the invited guests winds up murdered, it is up to Miss Marple to put all the pieces of the puzzle together. This 1971 story makes an intriguing watch, especially with the added obfuscation of the crime in question. Bertram's is a simple place of old world charm, where aging aristocrats gather in to enjoy the quiet pleasures of yesteryear. It is also just the perfect location for mystery and intrigue. Miss Marple arrives to find things just a little too perfect, and as her hunches are almost always right, she is set on uncovering what is really going on in this retreat from the modern world. A notoriously flamboyant society woman, a famous race car driver, an estranged daughter, and a door man with a mysterious past combine to create Miss Marple's latest challenge. The setting for Christie's 1965 story was based on Brown's Hotel in Mayfair, where the author was a frequent visitor. Miss Marple does her best to find herself in all the right places at the wrong time. When Gerry Burton and his sister Joanna arrive in the quaint little town of Lymstock, little do they know they will be the next recipients of a series of poison pen letters that has the villagers suspecting each other. Fortunately, the arrival of the vicar's houseguest, Miss Marple, begins to unravel the mystery�but will she be able to determine the author before the letters go too far? The source for this episode is one of Christie's personal favorites. Written in 1942, The Moving Finger keeps us guessing until the end. Ruth van Rydock, an old traveling companion, invites Miss Marple to her sister's sprawling estate, which is also a controversial rehabilitation center for young men. All-too-soon they discover mischief at work, and when a visitor is found murdered, Chief Inspector Slack arrives on the scene to solve the crime. Complicating matters is an apparent plot to poison Ruth's sister, and as the bodies begin to mount, only Miss Marple is able to decipher the clues. Slack and Lake make another appearance. While I found this one fairly engrossing, I was a little let down with the ending, which seemed to leave too many loose ends. Image Transfer Review: Image quality is variable throughout this collection, which is presented in its original 1.33:1 aspect ratio. Color is fairly good, if somewhat flat looking, though there is some bleeding especially in the reds, and browns tend to be murky. Black levels are adequate, but low level detail is lacking, and the overall look is somewhat soft. The source material is far from pristine, however the transfer adds its share of flaws, which are numerous, but generally limited to specific shots, including excessive shimmer, and sporadic video tape glitches. Compression artifacts are abundant. Dark scenes, especially those heavy on the blue, are prone to be granular. While the defects are distracting, for the most part the image is acceptable, but hovering in the average to below average for TV based material. The worst looking episode is The Moving Finger, which has a wavey appearance throughout. Audio Transfer Review: Stereo audio is clean for the most part, with a respectable, if not outstanding, mix. Dialogue is easy to discern, and there were no glaring technical problems noted. This serves the material well, and does not distract from the presentation. Extras Review: Extras are fairly light, consisting of a brief Agatha Christie biography, an index of the Miss Marple stories, plus a biography and filmography for Joan Hickson, all of which are found on the third disc. There is a bit of a packaging gaffe, as the images for They Do it With Mirrors and The Murder at the Vicarage are transposed. Overall, the five feature-length BBC productions on this three-disc set are another fine collection of mysteries, and while they may have a few shortcomings, Joan Hickson is a pleasure to watch, and I see no reason not to recommend this set to fans of the genre. For the most part, the stories are fairly unpredictable, and the supporting characters give each episode its own flavor. 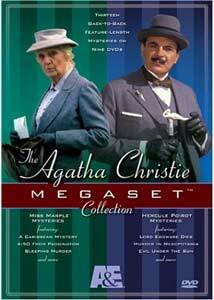 Agatha Christie's Miss Marple: Collection Two is available separately or as part of the Agatha Christie Megaset Collection, which also contains Miss Marple: Collection One, Agatha Christie's Poirot, Poirot: Evil Under the Sun and Poirot: Murder in Mesopotamia.